The Carpet Chemist is on call for your emergency water extraction needs 24/7 365 days a year, with truck loads of dehumidifiers, air movers and air scrubbers if need be. If your home or office has a water leak and you need to get the carpet dry, the best thing you can do is call us right away to prevent carpet backing delamination, mold and mildew growth, and sour musty odors from mold that give you severe headaches or make it hard to breathe. The faster you call us, the faster we can get your home back to normal. We utilize extremely powerful vacuums mounted on our trucks that are able to remove hundreds of gallons of water per hour. Even if you have a small section of damp carpeting, if not dry within 72 hours, it can start to do permanent damage to your carpets and even affect your health. Water extraction is the most crucial part of the drying process. Water Extraction. Please move any furniture that you can so we may begin our water extraction process from the carpet, padding and sub-floor. Padding Removal. Carpet padding is essentially a giant sponge that makes walking on your carpet more comfortable. Once the padding is affected by water or sewage backup, the damp area of padding must be pulled and discarded appropriately. Mold/Mildew Treatment. Immediately after the water has been extracted and the affected padding removed, we will treat the sub-flooring, back of the carpet and top of the carpet with a mold.mildew preventative/eradicator. Air Movers. Now that the water has been thoroughly extracted, wet padding discarded, and the damp areas treated, it’s all about drying it out with industrial air movers. The industry standard that all air movers must be running constantly for a minimum of 72 hours. Dehumidifiers. There will be moisture in the air when a water damage occurs. We will leave at least 1 industrial dehumidifier in the affected area for no less than 72 hours per the IICRC guidelines. 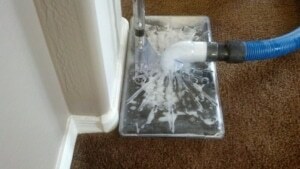 This will draw the moisture out of the air and the liquid will be disposed of down a drain. Re-installation and Cleaning. After 3 days, we will return to reinstall the new padding, restretch the carpet and clean and sanitize the carpet that was affected, as long as the moisture readings dictate it is safe to do so. Day or night, we’re here for you! If your carpet is flooded, Carpet Chemist can help. During a comprehensive, on-site consultation, we’ll provide upfront estimates for water extraction, carpet repair, cleaning, re-stretching, and more. Call (800) 515-1342 to speak with our emergency water extraction specialists. To inquire online, click here.